Since the 2009 amendments to the Family Law Act 1975 (Cth) there has been an appropriately increased awareness of family violence and its impact upon its victims. There has been significantly less focus upon the consequential impact of this increased awareness of family violence upon the workload of the Federal Circuit Court. That impact will be the focus of this article. 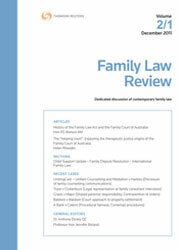 This article will examine data regarding the frequency with which allegations of family violence, abuse, drug and alcohol use and mental illness or disorder are raised in parenting cases and explore the workload and resource implications of those allegations as regards not only the Court but also external agencies such as the police and child welfare agencies, Legal Aid Commissions and community-based services. Based upon a consideration of that data, this article will suggest that the parenting workload of the Federal Circuit Court is complex and demanding, having myriad implications for the Court and the litigants the Court serves. Considering the numerous benefits associated with alternative dispute resolution (ADR), there is significant interest in facilitating the participation of a range of couples going through relationship dissolution in these processes, including couples experiencing domestic violence. However, even the most staunch advocates of these processes argue that not all couples experiencing domestic violence should be given the opportunity to participate in ADR. The issue for practitioners then is identifying which couples should and should not be included in ADR processes. This article explores the potential of domestic violence typologies, specifically the work of Michael P Johnson, to inform decision-making in relation to the participation of couples experiencing domestic violence in ADR processes, and the identification of barriers to the safe participation of parties. The two most important manifestations of open justice are that the doors of the courts are open to members of the public and that what is seen and heard in the courtroom can be reported to the public at large by those who choose to attend. Section 121 of the Family Law Act 1975 (Cth) qualifies the second manifestation of open justice – the right to report – by prohibiting the publication or dissemination of any information that would identify participants in proceedings under the Family Law Act. This article examines s 121 from an operational perspective with a view to evaluating its reach and its efficacy, particularly in this electronic era when anyone can be a publisher. After examining s 121 in depth and concluding that the legislation is complex and at times ambiguous, this article recommends that the time may be ripe for an in-depth examination of s 121 with a view to amending the legislation to take account of the internet and its vast and indiscriminate audience. Recent amendments to the Child Support (Registration and Collection) Act 1988 (Cth) mean that appeals in child support cases to the courts are now dealt with under the Administrative Appeals Tribunal Act 1975 (Cth). These amendments have reduced the options traditionally open to child support litigants as to where their litigation may be conducted. Sir Owen Dixon would recognise this development as a narrowing of what he called “the autochthonous expedient”. What are these changes and what do they mean in practice as to where child support litigation is to be conducted? Among the many significant principles arising from the High Court of Australia’s decision in Stanford v Stanford, was the Court’s reminder that it should not be assumed that it is just and equitable to make an order for property settlement merely because there has been a marriage or because an order to that effect is sought. Considering this principle further, the Full Court of the Family Court in Elford v Elford raised the possibility that a court could find that it is not just and equitable to make an order altering proprietary interests in an individual asset. This article explores the potential ramifications for property settlement cases if such an approach is adopted. Persons facing family law proceedings with limited support networks, who are prone to mental illness, may face challenges in securing appropriate property distributions in the courts. Such litigants may disengage with the litigation process, and the courts have difficulty grappling with the needs of litigants who may not have decision-making capacity. Where these circumstances are present, the role that friends and family can take in making application for appointment of a guardian and/or financial administrator, are of increased importance. For the PDF version of the table of contents, click here: Fam L Rev Vol 7 No 1 Contents.